It was around 1:30 pm when 70-year-old Ghulam Hassan Sheikh, a cobbler, heard that Hizbul Mujahideen commander Sabzar Ahmad Bhat was killed by security forces a few kilometres away from his Shopian home. As the news spread, youth poured on to the streets to protest. Shops downed their shutters. Sheikh decided to ask a few policemen walking towards him if he could continue mending shoes or if he should shut shop. As he started to speak, the policemen began shooting pellets at him, injuring his head and body. Drenched in blood, Sheikh was taken to a local hospital and then shifted to Srinagar’s Shri Maharaja Hari Singh Hospital. Sheikh is writhing in pain. His left eye is severely injured. Sheikh wasn't part of the protest but was still caught up in the crossfire. A civilian died and more than 40 others were injured during the protests that continued Sunday in parts of Kashmir as the people demonstrated against the killing of two militants by security forces. The Hurriyat Conference has called for a two-day shutdown and asked people to march to Tral on 30 May to pay tribute to Bhat and the civilian who was killed. A fresh wave of uncertainty has gripped Kashmir. People are staring at a bleak summer similar to 2016 when 78 people were killed by government forces in the protests that followed the death of Hizbul commander Burhan Wani. Recounting the “horrific moments’’ that he went through, Sheikh said, “It was as if blood was flowing from a tap. I had never gone through anything remotely close to what I experienced on the day of Sabzar's killing. It is the worst that can happen to a man. The worst is happening now. They (forces) should fire bullets rather than leave people incapacitated with the use of pellets,’’ he said. “Chief Minister Mehbooba Mufti has failed to rein in the security forces," he added. The stories of people who were admitted to hospitals in Srinagar tell the tale. Seventeen-year-old Mohsin Bhat was walking home after his tuition when he came across young Kashmiris clashing with government forces at the main square of Pulwama. He wanted to run away but it was too late. Before he knew it, he'd been shot in his right eye. He was soon shifted to a Pulwama hospital, then sent to Shri Maharaja Hari Singh Hospital. That's where I found him, wearing black glasses, his hand covered in bruises. 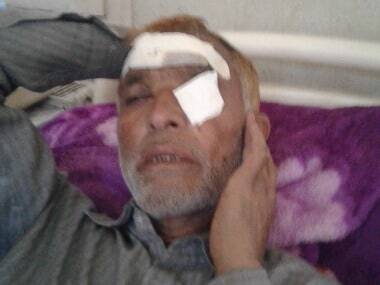 Mohammad Ashraf Bhat, father of Faisal Ahmad Bhat, who was also injured in pellet firing by forces in Shopian, said his son was heading home after school was suspended due to the tense situation. “He has sustained a pellet injury in his left eye. He has already undergone a surgery but he has developed blurred vision," Mohammad said. Outside the surgical intensive care unit (ICU), relatives of Sameer Ahmad Bhat of Mattan, Anantnag are waiting patiently. Bhat has been in a coma since he was hit on the head by a tear gas shell on Saturday. His cousin, Shabir Ahmad Wani, said the paramilitary forces fired tear gas shells inside the higher secondary school at Mattan, where Sameer was studying. “Sameer's friends took him to the hospital. They told us that the students, boys and girls alike, were participating in a pro-freedom march. Now, he is critical. The forces didn't even spare the students," Shabir laments.